One way to do this is with plantation shutters. These can be a great option for a nice clean look that not only provides privacy but also elevates the character of the house. They add style and a great chunky architectural texture to the windows themselves! Also, they are easier to maintain and keep clean than a cloth or fabric window treatment. Repeating the shutters in multiple rooms will bring design consistency around the house and even to the exterior. Some are worried that plantation shutters may obstruct their view, but with wide louvered shutters you can easily see out to the enjoy the outdoors and gets lots of light in the room while still getting privacy by adjusting the louvers. Shutters can easily stand alone as their own treatment or look great when framed with a pair of draperies to soften up the look. 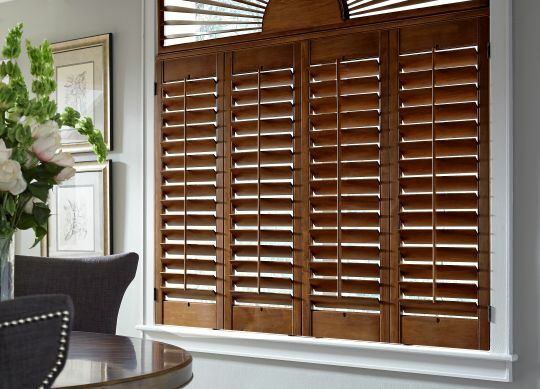 Of course, they are not the right solution for every house or window, but if you want the snuggest room in the house on a chilly night, shutters might be just what you’re looking for. At Flair Interiors, we pride ourselves on providing our customers with the absolute best interior design services in the area. Whether you’re looking for window treatments, new furniture, or a few decorative accessories, you can count on us to provide experienced, professional advice. If you’re considering making changes to your home, we encourage you to contact us today to discuss your needs!